ON A TERRACE FURNISHED WITH A TABLE AND A DECK-CHAIR. OUR FLAT IS IN ONE OF THE MOST ANCIENT DISTRICT OF THE CITY .IF YOU STAY IN OUR HOUSE YOU CAN COMPLETELY LIVE NAPLES.YOU CAN KNOW SOME CHARACTESTICS OF NAPLES.AND SOME HIDDEN PLACES. YOU CAN ENJOY THE CITY WITH THE ASSISTANCE OF THE OWNER. CRAFT MEN SHOW THEIR PRECIOUS WORKS OF ART:IL PRESEPIO,THE NEAPOLITAN TYPICAL NATIVITY SCENE AND IT IS ONE OF THE SYMBOLS OF THE SPIRIT OF NAPLES. THE HOUSE IS NEAR CENTRAL STATION AND MOLO BEVERELLO (PORTO). SORRENTO AND AMALFITAN COAST,TRAIN FOR POMPEI(5MINUTES),AIRPORT(2KM). "Deep in the heart of Centro Storico we enjoyed a comfortable 8-night stay in IcoloridiNapoli. A clean, practical, on-the-roof apartment, with smart, well protected roofterrace. However in a most densily populated quarter, there was silence in the night (not mentioning the occasional mosquitoes) and hardly boring noise during the day. Many sights (and trainstation and harbour) within walking distance. Piet M., Amsterdam"
"We enjoyed our stay very much. The apartment is well equipped and spacius for its size, that was just right for our family of 5 people. The place is quiet and clean. The owners were kind and supportive to us." "The accommodation was very good, clean and tidy." 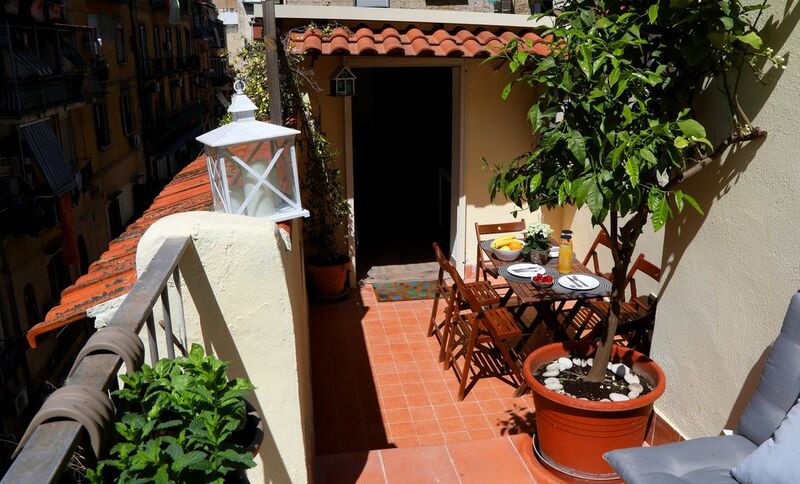 "This is a lovely Naples apartment in a very central location between the Corso Umberto and Via Duomo. The apartment was clean, modern and well equipped. The owner and his family were very friendly and helpful, providing maps, directions and restaurant suggestions. We were able to absorb the Naples life with the locals and thoroughly enjoyed it. Would highly recommend! Abbiamo fatto una buona vacanza. Grazie a Vincenzo e suo famiglia." The neighbourhood was friendly even though we did not speak Italian. It was difficult to find at first due to not being marked on our city map although in a good central location. Emails were difficult to communicate with due to the language but we got through it and the owner was very pleasant. Sehr schöne renovierte Wohnung im Zentrum. Allerdings im 4. Stock. that only here you can find. From the aereoporto to take alibus and to go down away cathedral.